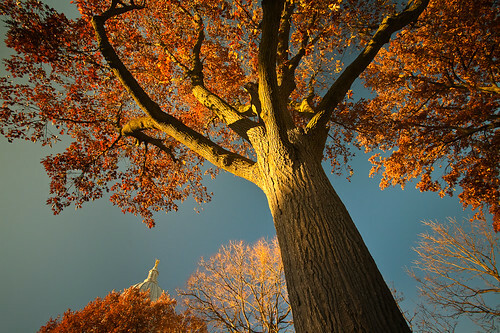 This entry was posted in Photos and tagged "Dane County", "Madison, 2011, afternoon, Autumn, blue sky, branches, canon EF 17-40mm f/4L USM, canon EOS 5D, canopy, capital, capitol, capitol square, Color, dome, Fall, golden hour, image, isthmus, landscape, leaves, light, loren zemlicka, nature, north america, north american, november, Orange, Perspective, photo, photography, picture, shadow, Sky, sunight, Tree, trunk, usa, wallpaper, Wisconsin by lorenzemlicka. Bookmark the permalink. Love the lighting on this tree shot. How do you like your Canon 5D? I am getting ready to upgrade cameras, but I’m having a hard time deciding between the 5D and the 7D. I like the idea of a full-size sensor on the 5D, but I don’t like the idea of having to deal with such huge file sizes…Also, I don’t want or need the video feature. Any input you can throw my way would be appreciated!